Transaction Codes (TC) consist of three digits. They are used to identify a transaction being processed and to maintain a history of actions posted to a taxpayer’s account on the Master File. Every transaction processed by the IRS must contain a Transaction Code to maintain Accounting Controls of debits and credits, to cause the computer to post the transaction on the Master File, to permit compilation of reports, and to identify the transaction when a transcript is extracted from the Master File. 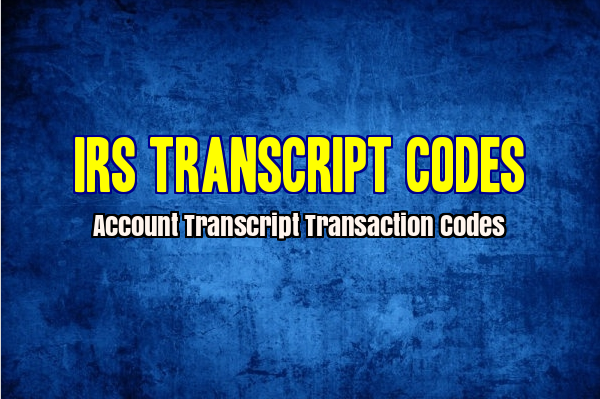 Transaction Codes (TC) record specific types of actions (e.g., debits, credits, etc.) onto the accounts/module. Some transaction codes indicate action on the Entity Module only, (e.g., TCs 149 or smaller). 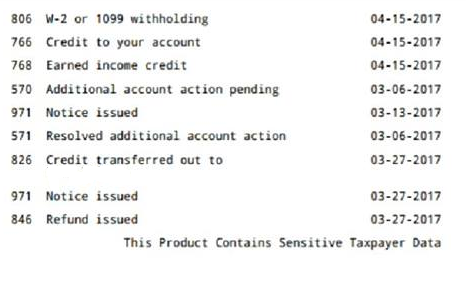 The IRS transaction codes are typically listed on a taxpayers account transcript. The transaction guide identifies many of the most often used codes. You can click here to get your transcripts! This account transcript verifies that you have been accepted and are processing and you will not have a confirmation of your status until after February 15th. If more information is needed the IRS will send you a letter or you can view your transcript online to see further codes after February 15th. Until your Explanation of Transaction list shows an 846 Refund Issued code you are not guaranteed your refund on any certain date. While the IRS is processing your return the Explanation of Transactions can change at any time. These transactions will keep you updated with what is going on with your tax account more accurately than the Where’s my Refund website or App. If you have certain codes that are held or freezes you can view your transcript online daily for updates. If you have a hold or freeze on your account you will have to wait for a release code to post to the transaction list before you would see an 846 refund issued code. The Transaction Code 570 Additional Account Action Pending will stop a refund from being issued until the impact of the action being taken on the account and the refund is determined and processed. If you have a 570 code there is a good chance you may receive a letter explaining any adjustments to your account. If you have a 570 code on your account transcript you will need to wait for a 571 or 572 resolved additional account action code to post which will reverse the 570 code before you would see a 846 Refund issued code. If you view your online or mailed transcripts and you see the 846 Refund Issued code under the Explanation of Transactions list. Your return is done processing and you should be receiving a Direct Deposit or Paper Check within 5-10 days. Code 766 credit allowance posted in error. Results from the appropriate line item adjustment of an Examination or DP Tax Adjustment with item reference 334 (199312-199411 only) for an installment of 1993 additional taxes. Code 767 w/OTN Reverses a prior posted TC 766, TOP offset reversal when input with the same offset trace number (OTN). Caution: This transaction must not be input except to correct a TC 766 on the FMS Reject Listing. Code 836 Refund you chose to apply to next year’s taxes. Transaction Codes (TC) consist of three digits. They are used to identify a transaction being processed and to maintain a history of actions posted to a taxpayer’s account on the Master File. Every transaction processed by the IRS must contain a Transaction Code to maintain Accounting Controls of debits and credits, to cause the computer to post the transaction on the Master File, to permit compilation of reports, and to identify the transaction when a transcript is extracted from the Master File. Transaction codes that are unique to IDRS are also included. The definitions of several transaction codes are necessarily changed since there will be no resequencing, offsetting, or computer generated interest. In addition, all refunds will be scheduled manually with the refunds posted to the IMF using TC 846. 300 I/B D Additional Tax or Deficiency Assessment by Examination Div. or Collection Div. 301 I/B C Abatement of Tax by Examination or Collection Div. 592 B/I/E Reverse 59X Trans. If you have any questions about transaction codes your account transcripts or want to help others on the tax refund hunt then comment below to tell us what codes you are deciphering while you wait for your tax refund.